Having scored a great many tasty waves during my monthlong surf safari in Bali (although not a single barrel despite my high hopes for doing so), by October it was time to sell the Black Beauty to a very stoked Brazilian, pack up the rest of my surf gear and move on to Phase 2 of the trip which some of you readers will be happy to know wouldn’t involve a single wave (tasty or otherwise) as it would take me to Bangkok and Northern Thailand, Laos and Cambodia. 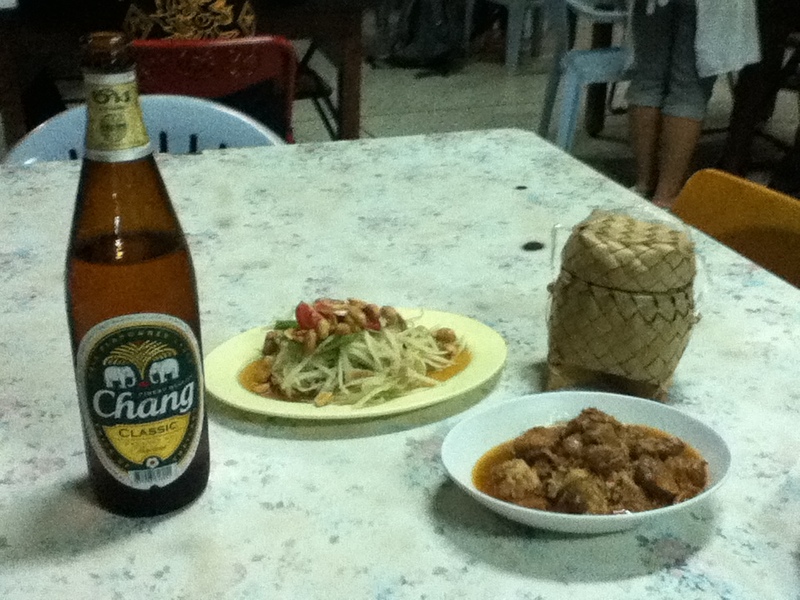 I began with a few nights in Bangkok. 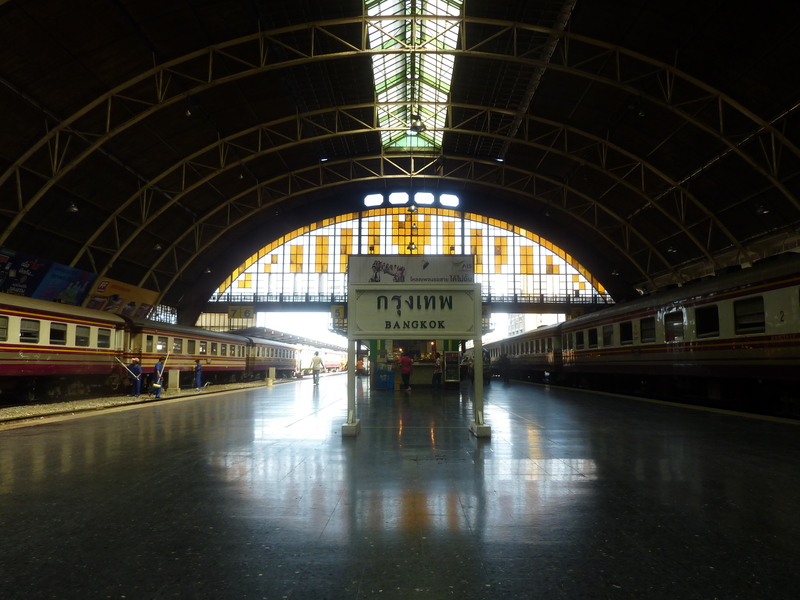 From there, I took a train to Sukhothai for two nights before heading further north by bus to Chiang Mai for a week. I was a little less than diligent in blogging during this time and thus I’m going to just cover a few highlights in this post. 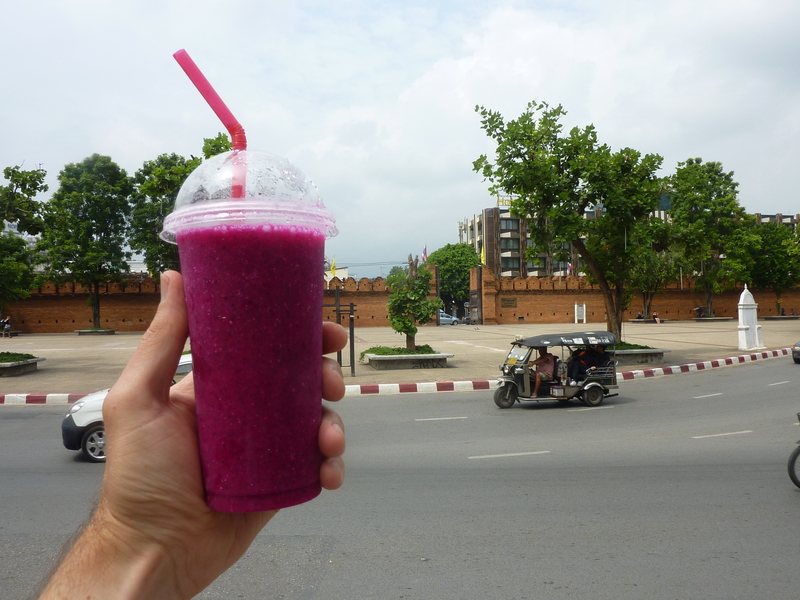 I’ll be back through Thailand again in January and I’ll hopefully write in more detail about it then. But for now here are a few randomly ordered thoughts and pictures from my two weeks there in early October. Bangkok is big and the traffic is every bit as bad as advertised particularly when you arrive in a downpour during rush hour. I quickly learned that street addresses often aren’t that useful for locating buildings and communicating in English with a taxi driver who only speaks and reads Thai can be challenging. 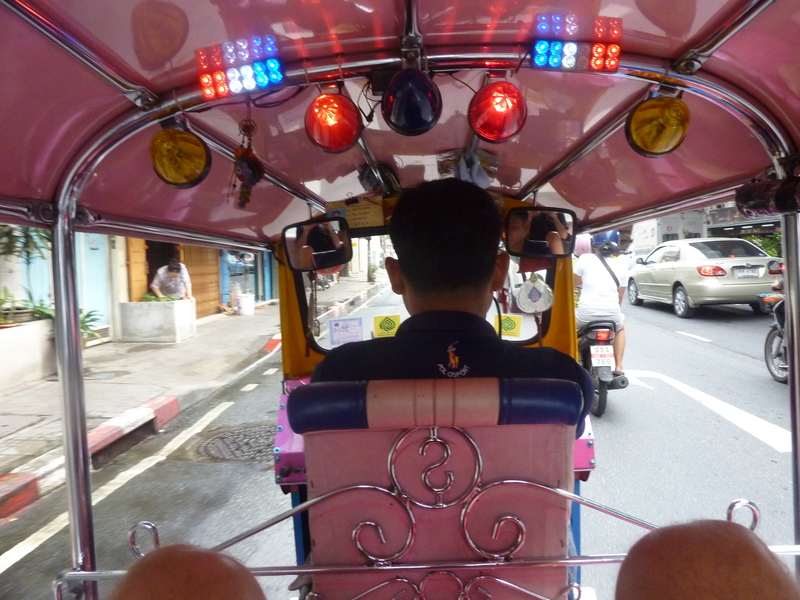 That being said, I dig Bangkok. It seems to be a very happening city and I’m looking forward to exploring it more as I’ll be in and out of there several times on this trip. 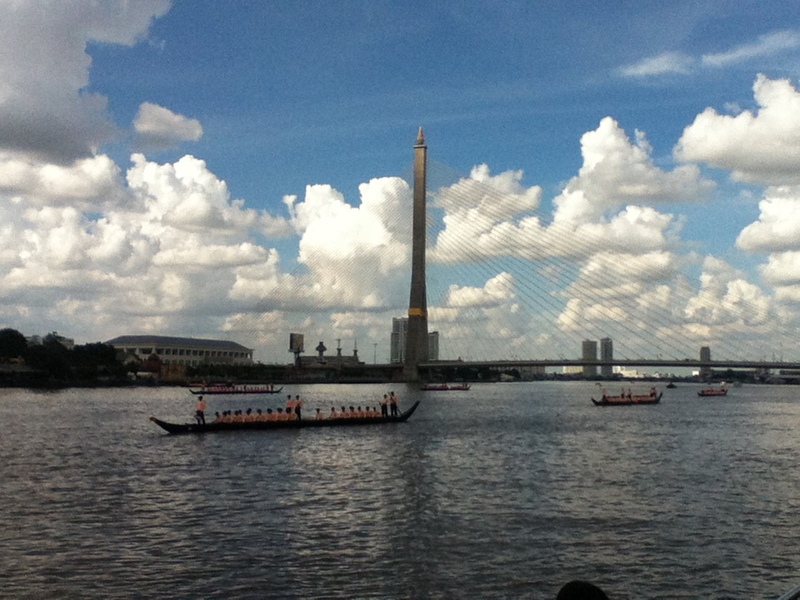 Taking to the river or canals is one way to avoid the goat rope of Bangkok’s streets. But when taking the water taxis you don’t necessarily get to wear matching outfits or paddle in unison or chant as these guys were doing one afternoon as part of a barge ceremony. 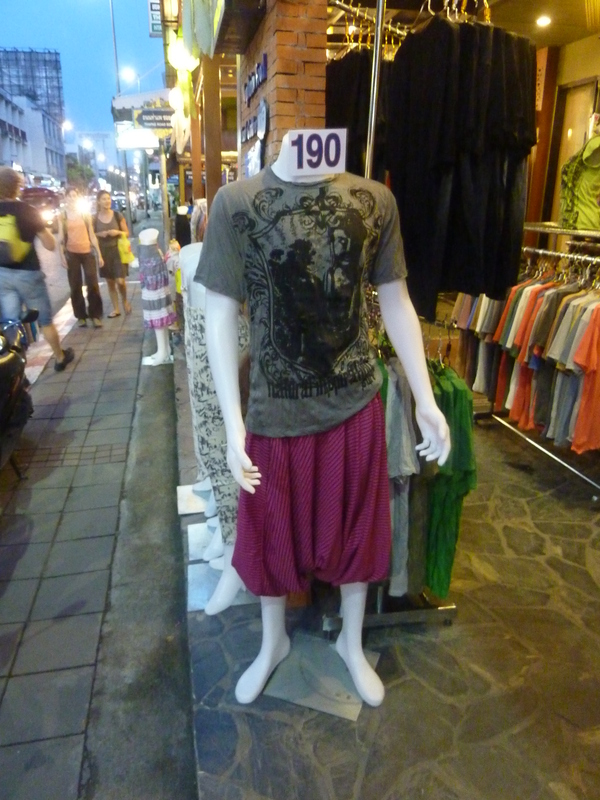 Why does a certain type of male backpacker feel the need to buy and wear puffy pantaloons while they’re in SE Asia? What makes this travelwear in their minds? Do they wish they were genies? Jugglers? Do they wear them when they go home? Would they wear them when traveling elsewhere? To Rome? Tokyo? Moscow? New York? If they did so for the latter, would their chances of getting mugged increase exponentially? Should I buy some for my pals back home? 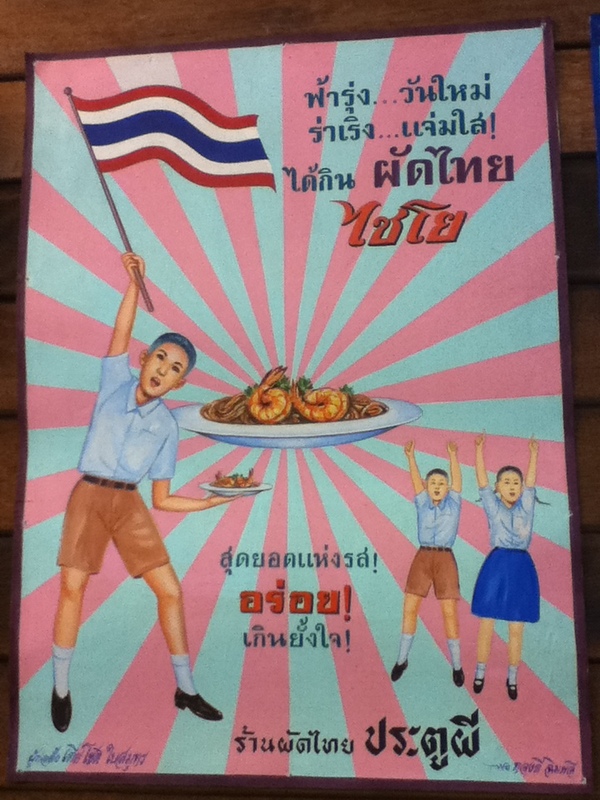 I’m fairly certain that the one kid is waving the flag and the other two kids are jumping for joy because as Thais they often get to eat Pad Thai. And in that particular restaurant, as well as several others I visited, they wrap it all in a very thin omelette rather than incorporating the egg into the mix which is generally how I’ve seen the dish approached stateside. 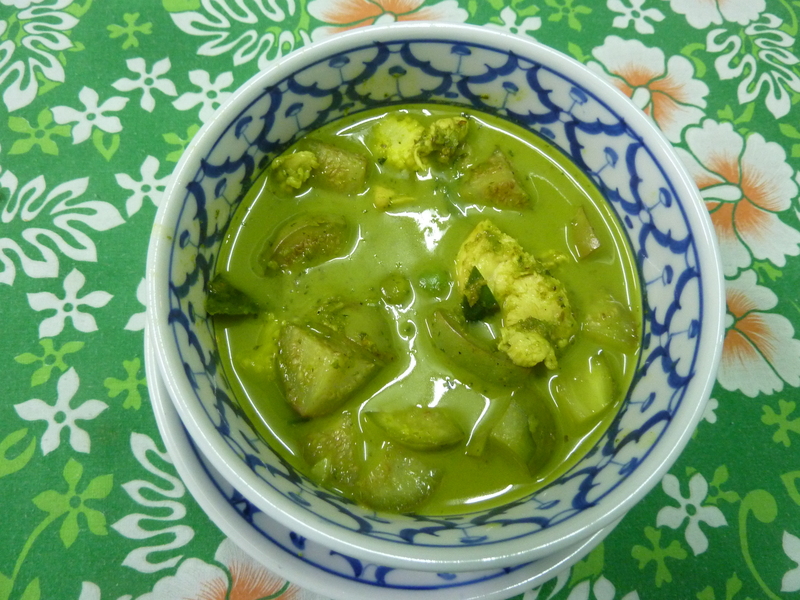 While it wasn’t among the best green curries I tried in Thailand, it was nevertheless a solid dish although that is really owing more to the ingredients selected for me than my handling of them. Chiang Mai curry is a dark red curry with tamarind and peanuts in it and I believe it generally incorporates pork. When served with Som Tum (papaya salad which is also tremendous over here), sticky rice and an ice cold Chang, as it was for me at Aroon Rai in Chiang Mai, it makes for a most formidable meal and the best I had in Thailand during my first go around there..
As background info for the precious few of you who haven’t been keeping up with my exercise habits over the past couple of years, I started taking Muay Thai (aka Thai kickboxing) classes in Los Angeles last year and thus I was very excited to see a few bouts in Bangkok and find a gym at which to try my hand (and my elbows, knees and legs) at some training. 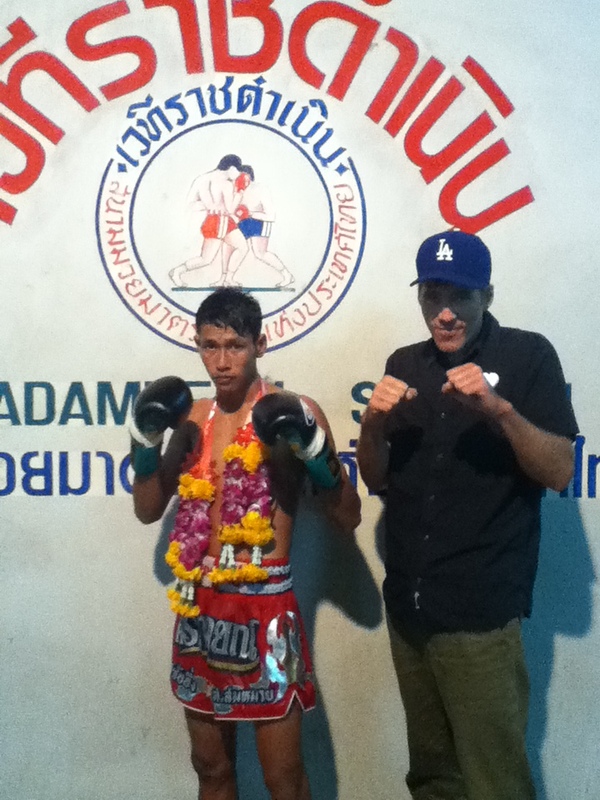 I had a blast pretending to be a real fighter for a few days and I’ll definitely be headed back to the same gym in late December upon my return to Chiang Mai. 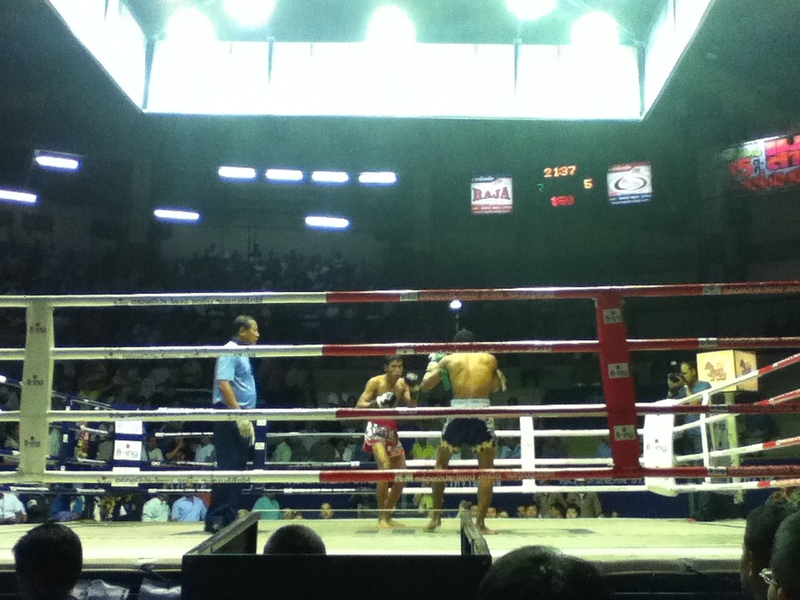 I’ll also be catching at least one more evening of fights in Bangkok so keep your eyes peeled for another entry of The Getting There’s Man Slammin’ Muay Thai Max Out in the not too distant future. 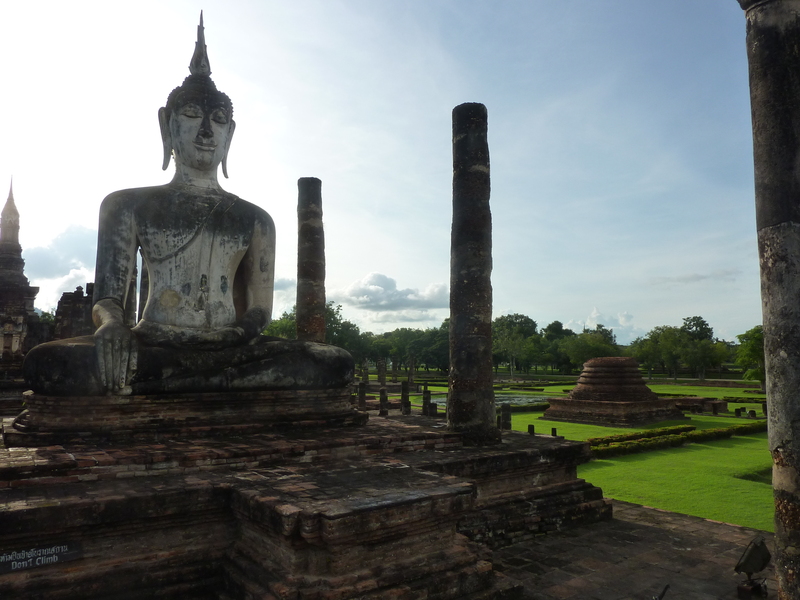 Sukhothai was the capital of the kingdom from roughly the 13th to the 15th centuries and there are some UNESCO designated ruins from that period located just outside of town. 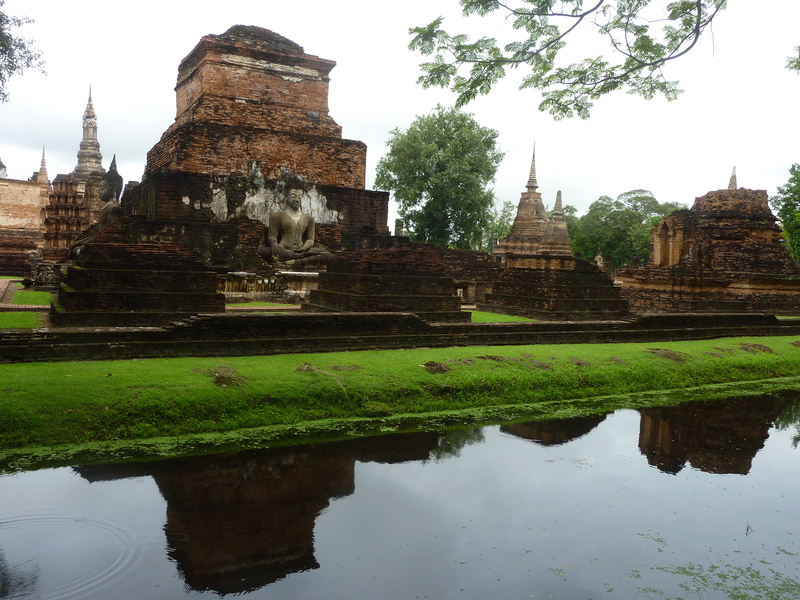 I spent a day wandering around the ruins which were certainly interesting but, in my opinion, by no means mandatory for a trip to Thailand particularly because visiting them means the popular overnight train between Bangkok and Chiang Mai won’t be an option. The monk in this photo and I spent the better part of an hour discussing Buddhism and his day to day life as a monk as part of a program at Wat Chedi Luang in Chiang Mai in which monks are available most afternoons to talk with visitors about Buddhism and other topics. The monks, in turn, have the opportunity to practice their English. It was really cool and I learned quite a bit about what his life as a monk entails such as very early wake up calls, lots of meditation, chores, studies not only in Buddhism but in other religious traditions as well and no running or other rigorous forms of exercise in public. In fact, I don’t think they are really supposed to exercise at all other than strolling about town. But the monk I hung out with confided in me that he sometimes does push ups when the elder monks aren’t around. Shaolin monks these are not. He is 23 and became a novice at the age of 14 which required him to leave his home in a small village near the Burmese border to live at a temple, or wat, near Chiang Mai. I learned that one reason many boys become monks is the fact that it provides them with the opportunity to get a good education and, once they have that education, many move on to life outside of a monastery. In fact, the monk I chatted with was but a year away from receiving his university degree in both religion (which is a required course of study) and education (a course of study that he selected) and it sounded like there is a good chance he will eventually turn in his monk’s robes to become a school teacher back in his village. But our discussion was not confined solely to Buddhism as we touched upon several other topics of vital importance such as Premier League Football and Jackie Chan films. Talking with him made me realize that many Buddhist monks are just regular dudes with whom I have far more in common than I would have anticipated. 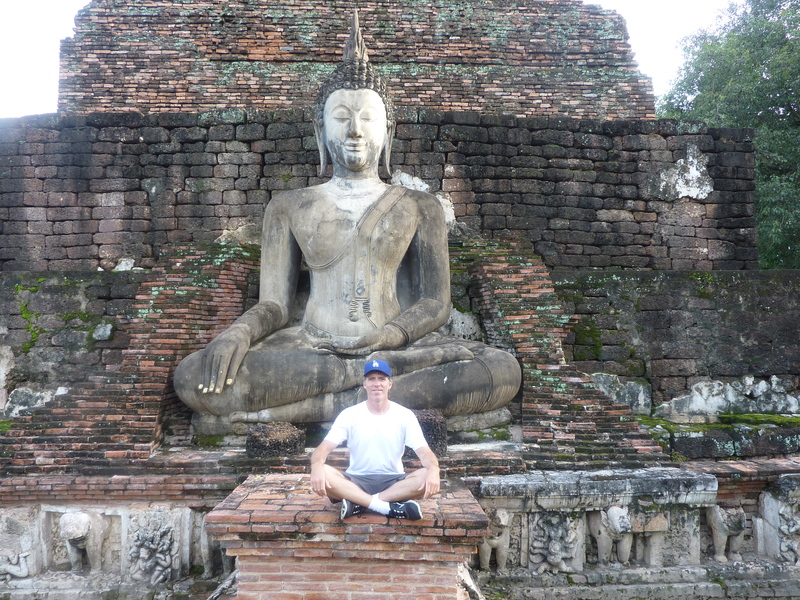 I’m definitely planning to return for another round of Monk Chat when I’m in Chiang Mai again in December. And that’s all I have on Thailand for now.